ALL REGISTRATIONS REQUIRE A $200 NON-REFUNDABLE DEPOSIT, DUE AT REGISTRATION. NO EXCEPTIONS! ALL Players will receive 2 Jerseys (Home and Away), Game Pants and a compression shirt. Jersey Order will be placed 1st week of March and ALL Players will need to have a minimum of $400.00 paid to order Jersey with Name. Players that require Equipment will need to attend the Thunder office on Wednesdays ONLY 7pm-9pm. All registration will be done online by clicking the Registration button BELOW. You will require a current photo and 2 pieces of ID to upload when requested. Upon checkout you will be given your payment options, INCLUDING Early Bird Discounts if paid in Full by Feb. 8th IF you choose not to pay by Credit Card (Debit or Cash, NO Cheques) you will need to register IN-PERSON on Wednesdays, 7pm-9pm, at the Thunder Office, 710 Progress Avenue, Unit 3, REAR DOOR ONLY PLEASE BRING CURRENT PHOTO AND 2 PIECES OF ID. OR Pay from your Bank using PlayPay (information below), once the treasurer receives the payment you will be emailed a code to enter when completing the Registration. ALL Registration must be completed ONLINE before first practice- NO Exceptions. Pay OFC or Combo Fees in Full by Midnight on Feb. 8th get Early Bird Pricing. 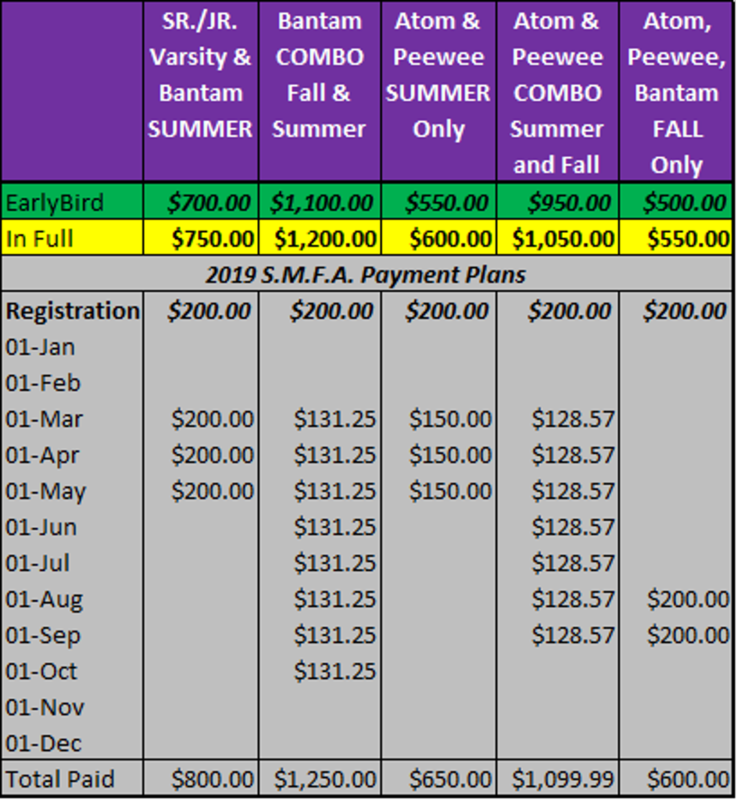 Pay OFL Fall Fees in Full by Midnight on July 31st get Early Bird Pricing. Any Funding applied for must be declared at Registration and will be deducted from last payments. Payment schedule must be up to date.Example-IF you register on April 10th All payments due up to April 1st must be paid at Registration. It is YOUR responsibility to advise the registrar of any funding and supply ON number and/or acceptance letters upon receipt. ANY PAYMENTS ON PLAN THAT ARE DECLINED WILL RESULT IN FORFEITURE OF PLAN AND ALL FEES ARE DUE IMMEDIATELY, PLAYER WILL BE REMOVED FROM PARTICIPATING UNTIL PAID. We're excited to let you know that we have signed-up with playpay.ca so you can make payments online from your bank. It's fast, it's easy, and you can make payments for free! Go to www.playpay.ca and choose 'create an account'. The sign-up process is real quick, and you'll receive an email with instructions on how to make payments. Any questions? Send an email to treasurer@scarboroughthunderfootball.com. You can also sign-in to your playpay.ca account and click 'my help'. Thanks for using playpay.ca to help us streamline the process of collecting payments and all that goes into it! 1. Select Scarborough Minor Football (SMFA) to your personal organization list. Enter SMFA in Organization and click ‘Search’. Select Scarborough Minor Football (SMFA) from the returned list and click ‘Next’. Include Division for Account Information, and the participant’s full name. Click the ‘Add Organization’ button and Scarborough Minor Football (SMFA) will be added to your personal organization list. REPEAT THIS PROCESS FOR EACH SMFA PLAYER IN YOUR FAMILY. Select the association/player from the dropdown and click ‘Next’. Choose the payment reason and enter the amount, and click ‘Next’. Choose from one of four ways to pay. There is a 2.5% convenience fee to pay by credit card. There is no cost to make payments by e-cheque (i.e., direct debit), bank payment or interac e-Transfer. You'll be notified by email when your payment is processed. Once the SMFA Treasurer Confirms the Playpay.ca payment you will be emailed a discount code to use to complete your SMFA Online Registration.